ISLAMABAD, Jan 24 (APP):Pakistan and Iraq have agreed to finalize the signing of longstanding Memorandum of Understanding (MoU) at the earliest aimed at ensuring legal and risk-free migration of the Pakistani manpower to Iraq. The agreement reached between Special Assistant to Prime Minister on Overseas Pakistanis & Human Resource Development and Iraqi Labor Minister Dr Basim Abdul Zaman Majeed Al Rubaie during a meeting held in Baghdad the other day. It was agreed that both the countries would work together for safe and legal migration of workforce from Pakistan, a message received here said. Both the dignitaries discussed the ways for finalizing the MoU pending for the several years. Under the MoU, Pakistan would share data of skilled manpower to Iraq. Both sides also agreed that Iraqi government would also facilitate Pakistani businesses by ensuring speedy processing of business visas. The possibility of investment by Pakistani companies in agriculture, animal husbandry, construction and real estate sectors was also came under discussion during the meeting. On the occasion, Zulfikar Bukhari said a safe Iraq was viable destination for making investments in the region, saying economic development in Iraq was a good omen. He appealed Iraqi government to also ensure the safety of Pakistani workers on its soil. The Special Assistant also expressed keen interest of the Pakistani companies to invest in the reconstruction activities of Iraq and apprised the Minister of labour about the initiatives taken by Pakistan Tehreek-e-Insaf led government to ensure ease of doing business in Pakistan. He said the present government was evolving a mechanism to relax visa regime for Pakistani businessmen. “All the economic sectors in Iraq have the potential to see extraordinary growth in future and Pakistan has ample supply of manpower that can prove to be crucial for the development activities in Iraq” he added. To this, Iraq’s Minister of Labour expressed his willingness to mutually work with the PTI government for the purpose. 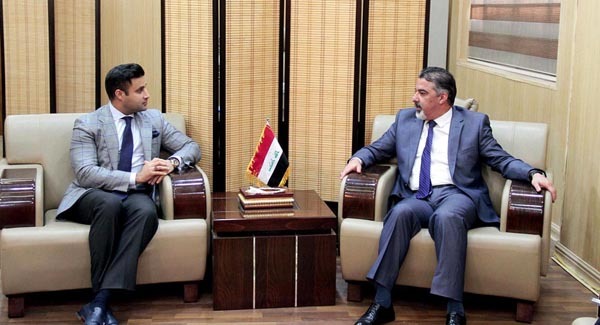 Earlier, Zulfikar Bukhari also met with Iraqi President Barham Salih at his office in Baghdad and appealed him that Pakistan sought an increase in export of Pakistani manpower to Iraq amid enhanced development activities. Both sides agreed upon creating a mechanism to increase supply of Pakistani manpower to Iraq.